It seems the best of both worlds when students can combine experiential learning with the opportunity to engage with people and cultures different from their own. Expanding immersive study abroad opportunities for students is one way the University is hoping to transform education as part of its Purdue Moves initiative. International experiences lasting a semester or longer are emphasized, and increased scholarship support is available. A good example of this type of holistic experience is the sponsored internship program in China available through the School of Hospitality and Tourism Management. Since 2000, about 120 students have completed the six-month internship offered at several five-star luxury hotels throughout China. They learn all aspects of hotel and restaurant management, work alongside their Chinese colleagues, take Chinese language classes, and have ample time for travel and sightseeing. 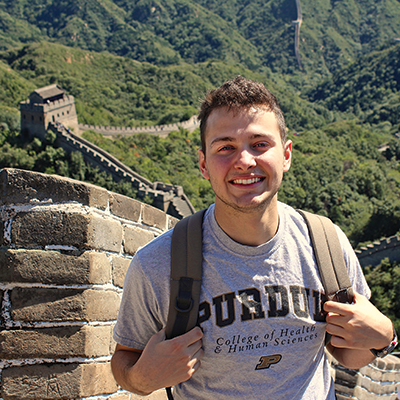 Christian Bencid had just finished his first year at Purdue when he took off for the Shangri-La Hotel in Guangzhou, China. He felt the experience would help him to become a well-rounded hotelier and improve his knowledge of other cultures. He also admits to wanting to push beyond his comfort zone and learn how to acclimate to new environments. The experience also revealed a potential career path. 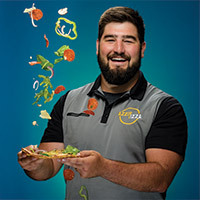 "One of the things I learned about myself is that I genuinely enjoy being immersed in a different culture," says Bencid, a junior in hospitality and tourism management. "The experience is what made me realize that I want to be involved in the international luxury market segment of the hospitality industry." Bencid just completed a second international internship this summer in Spain, where he worked with the financial controller and purchasing managers of two luxury hotels in Palma de Mallorca. It's this kind of experience that employers value. A Wall Street Journal survey of corporate recruiters ranks Purdue fourth in preparing students for the workforce. Alan Tuttle of Marriott International agrees. 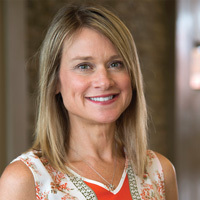 He is a manager of university relations and talent acquisition at Marriott, and says the company started recruiting at Purdue in the late 1980s and keeps coming back. The draw is HTM's top national ranking and graduates who are prepared to hit the ground running in the fast-paced hospitality industry. "Marriott continues our long relationship with Purdue due to the quality of students we have hired for internships and for our entry-level management program," he says. 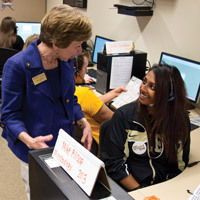 "Purdue students have a strong Midwestern work ethic and are excited about the industry." It's this kind of response from employers who are hiring HHS graduates that signals the college is successfully preparing the next generation of health and human science professionals & graduates like Miltenberger, who had a job waiting for her when she graduated. She's now a teacher at Whitney Young Early Childhood Center in Fort Wayne, Indiana. And remember Jones, the Health Sciences student researching the effects of manganese? His research was recently published in the 2014 issue of the Journal of Purdue Undergraduate Research.